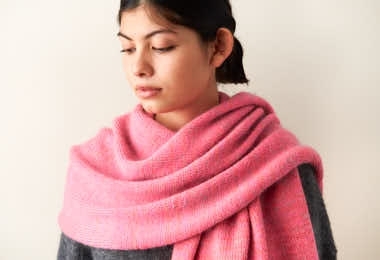 As even a casual follower of Purl Soho probably knows, we love a swath of stockinette fabric, and nothing does it better than our simple-as-pie Elementary Wrap pattern! For this version, we add a layer of visual complexity without complicating the pattern itself by combining a strand of our hand-dyed Posy with a strand of mohair-silk Tussock. The effect is a mysterious stew of color and texture, a beautiful blend of all the things we love about fiber! Our free Elementary Wrap In Posy + Tussock pattern includes instructions for an 18¼-inch wide Wrap and a 9-inch wide Scarf. This bundle includes enough yarn for the Wrap. For the Scarf, you'll need just two skeins of each yarn, available by buying each yarn separately. And for more information about materials, sizes, and gauge, just click Product Details, above. Yarn A: 4 skeins of Purl Soho’s Posy, 75% superwash merino, 15% cashmere, and 10% nylon. Each skein is 318 yards; approximately 636 (1,272) yards required. Yarn B: 4 skeins of Purl Soho’s Tussock, 60% super fine kid mohair and 40% silk. Each skein is 328 yards; approximately 607 (1,214) yards required. SAMPLES: We used the Pink Papaya + Bright Verdigris and Teal Twilight + Anjou Pear palettes for our samples. NOTE: For the 9-inch wide Scarf version, you will only need 2 skeins of Posy and 2 skeins of Tussock. NOTE: Our samples are the Wrap size. If you’re making the 9-inch wide Scarf size, please be aware that its edges may curl more due to the nature of stockinette stitch at the narrower width. Addi Turbo Rockets are the ultimate circular needles for speedy, snag-free knitting! Click here to see our full range of sizes and lengths, or click Add To Basket to purchase these US 5, 32-inch needles for knitting up an Elementary Wrap in Posy + Tussock!